← What will the story of education be? Who will write it? At the end of each school year, I ask my students to select several different writing assignments produced throughout the year and edit those pieces to reflect their current ability. My hope is that they will see and appreciate their own growth and development as writers in the process. These portfolios took the form of binders, until this year. 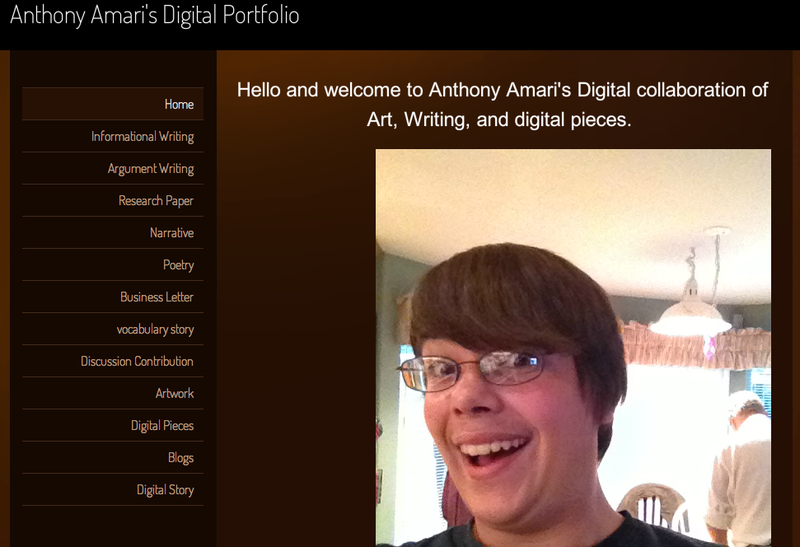 My class is almost entirely paperless now, which is why I decided to transition from a paper to a digital portfolio. Students write everything on Google docs and submit their work digitally, so it didn’t make sense for them to print out their work and create binders. Instead, I had them create a website and publish their revised work online. In addition to digital writing, my students have created infographics, multimedia timelines, Google presentations and digital stories. I wanted all of these incredible pieces displayed on their websites. Decide what website creator they were going to use. Provide clear guidelines for the content. Explain how I would be assessing their work. My first instinct was to make all of my students use the same website creator because that would be easiest for me. After some reflection, I decided not to control this element of the project as I did not want to limit their creativity. I explained that Google sites had a steeper learning curve but would work seamlessly with everything they had created using Google apps and YouTube. Conversely, Weebly is super simple to use, but it would be more challenging to embed their various digital pieces. My students used a variety of website creators, so I offered technology trainings at lunch for the first 3 weeks of their work on this project. I dedicated days to using Wix, Google sites, Tumblr, and Weebly. At times, it was chaotic in my room. I often didn’t actually eat lunch, but I learned a ton troubleshooting with students. For teachers considering a large scale digital project of any kind, I would recommend offering informal drop-in technology training/troubleshooting sessions. I would also suggest making short “how to” videos about using different tools to support students who get stuck working on their own. Next, I created a list of the different types of pieces I wanted students to revise and publish on their website. Click here to view the document I shared with my students. In addition to the written and digital pieces, I asked students to write a series of blog posts chronicling their work and reflecting on the process of creating their portfolios. Finally, I explained that I would be using voice comments instead of traditional hand written comments to assess their website and provide feedback. I wrote a blog post about “Using Voice Comments to with Google Docs for End of the Year Projects” which explains this approach. The portfolios created were visually interesting and, overall, the content was impressive. I love that this assignment combined writing, editing, revising and reflecting with a digital media component. For teachers stressed about transitioning the Common Core, this project simultaneously addresses almost every writing standard! 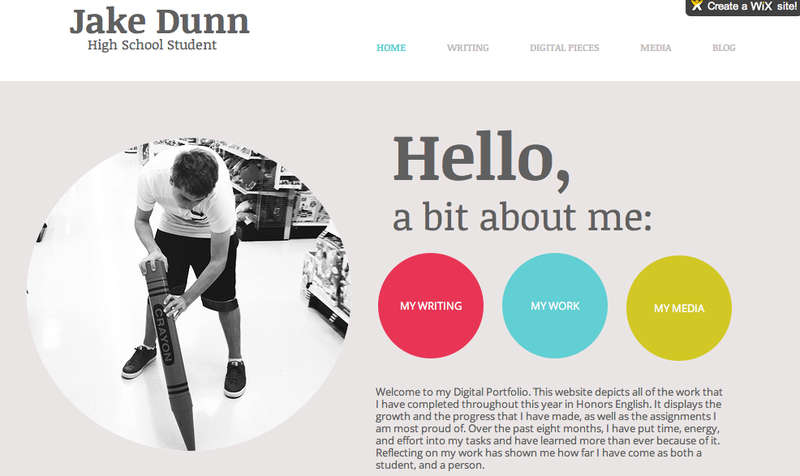 Below are a few of my favorite digital portfolios created this year. Just click on any of the images below to visit these student created websites! If you have students create digital portfolios and have advice or tips for teachers, please share them! They will definitely teach you, Heather! I learned so much from my students during this process. They are incredibly creative and many are extremely tech savvy. Thanks Catlin. 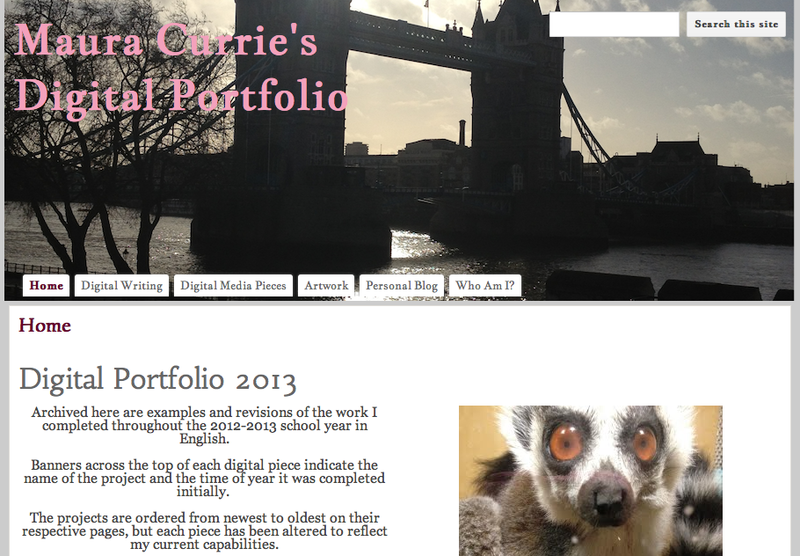 Creating a portfolio like that must a great activity for any student and teacher. That project helps them to store all their work and reflect about their progress throughout their academic year. I’d like to ask you if you marked their portfolio, how you did that and if you devoted a lot of time doing that. Thanks again. I gave each student between 10-20 minutes of voice comments on his/her website. It was incredibly time consuming. I had 172 students this year and 166 of them submitted digital portfolios. If you do the math, it was equivalent to working an entire 40+ hour work week just to assess this project. I wanted to make sure the time investment felt worthwhile to students, so I asked them to complete a quick Google form asking if they preferred voice comments, written comments or had no preference. All but one student who replied said they definitely preferred the voice comments. Only one student reported that they had no preference. Given that response, I feel this strategy was worth the time. I wrote a blog about using the Voice Comments app http://cluttered-record.flywheelsites.com/2013/04/using-voice-comments-with-google-docs-for-end-of-the-year-projects. Thanks for the great blogpost! Wondering why your students don’t use Blogger. I have tried Google Sites but noticed that they do not allow for others to add comments. I’ve just started to explore Blogger for next year. I like the way a website navigates better than a blog format for a portfolio, but I don’t know enough about Blogger yet to make an informed decision about which would be best. How are you using Blogger with students? I use weebly with 5th graders and there is a very nice built in blog feature. I found the extra features of using their education site really great as it allowed students to embed (I taught one student the pseudo code and they then became the expert teaching others), upload, and comment. Another really great tool if you have iPads is ShowMe which allows students to take images of their work and create annotated voice overs, which they can then embed on their site. I found overall that student experts were a great way of encouraging collaboration and a really positive learning environment that promoted understanding and respect. Plus it saved me a bunch of time. Students also created tutorials in their ‘expertise’ as a way of helping others and also as a nice piece of procedural writing and visual representation – bonus! 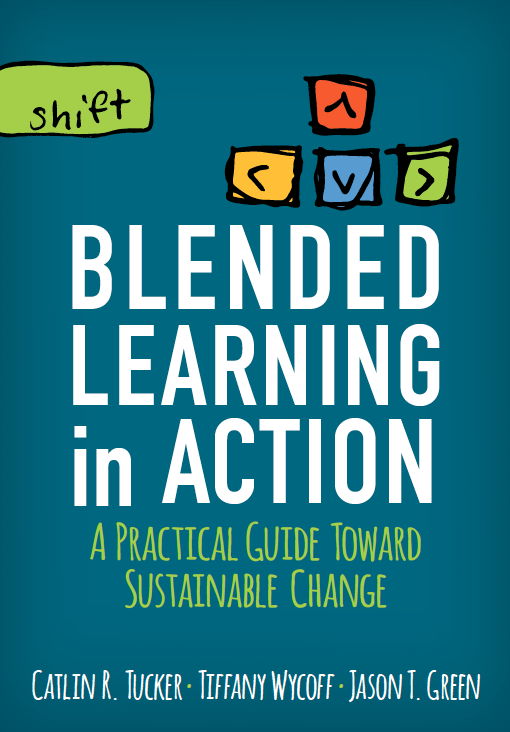 They could view these from home anytime they needed to – flipping the classroom and using student experts meant that I could really focus on workshopping the things they really wanted to work on instead. I love the idea of having students flip the classroom with their own tutorials. I can definitely see this being an effective strategy when tackling the variety of questions that pop up during the creation of portfolios. I’m always looking for ways to allow students to teach students! Thank you for sharing your experiences. Thank you for this post! I love this. I want to eventually move my classes towards digital portfolio so not only do I have a collection of their work (in an organized manner!) but also they would have easy access of their work as well. Your post has definitely inspired me to move forward with my ideas. I’m so glad to hear this post inspired you, Krystina! I, too, love having all of their work organized and easily accessible. It was incredibly rewarding to see the evolution of their written pieces over the course of the year. I’m toying with the idea of having their portfolios be a year long project that they are continually adding to, instead of having them work on it the final month and a half of school when they have several culminating projects for other classes. There are benefits to having a project of this magnitude be an ongoing work in progress. For those students who do not have strong time management, they will probably end up with a stronger finished product if they tackle a little bit at a time. I also like the idea of building in more time in class to walk them through the “how tos” of embedding video and uploading images. These details can be overwhelming for students who are less tech savvy and leave their portfolios to the last minute. I wanted to share this alternative strategy with teachers who are working with younger students or are tackling portfolios for the first time. The year long approach may be less intimidating for students. Your students’ work is fantastic.I am just starting to dabble with e-portfolios for my Textiles students. I have been looking at Evernote but these websites look great. anyone else used e-portfolios for D&T subjects? I’m very proud of what my students created. I had not considered using Evernote for digital portfolios, even though I am a huge fan of Evernote for organizing my own information digitally. This is a very interesting point. Also, there is a way of sharing content via links e.g. the web presence of a student or links connected with a portfolio via http://urli.st/ ; you can also make a list of portfolios via this website if you want! Thank you for the suggestion, Mark! Great idea Caitlyn! I’m looking at how to best incorporate writing portfolios across the high school next year and you’ve definitely given some great pointers to take it digital! If you are looking to incorporate writing portfolios across an entire school or across disciplines, Google sites is a great option because sites can be shared with specific teachers as students work (before they are published to the world). Thank you for this! I have been using OneNote with a few classes for their digital portfolios and other assignments. I love how you gave the kids a choice of the tool/software they want to use and how you have technology sessions for them. I strive to do this in our media center and it’s been working great! Thank you for the comment, Po! Allowing students the freedom to choose the tools they were drawn too has the benefit of fostering creativity, but it also mirrors the real world. Too often teachers require students to use one tool because it is easiest for the teacher. Whenever possible, I allow students to select the best tool for the job. It can be chaotic, but the end result is almost always stronger. The tech sessions were key to ensuring that this freedom of choice was successful! I have not tried OneNote, but I’m going to check it out if you have had success with it. I would love to have my students engage in creating digital portfolios but I have one obstacle: 13. Apparently a student has to be 13 or older in order to use anything Google. 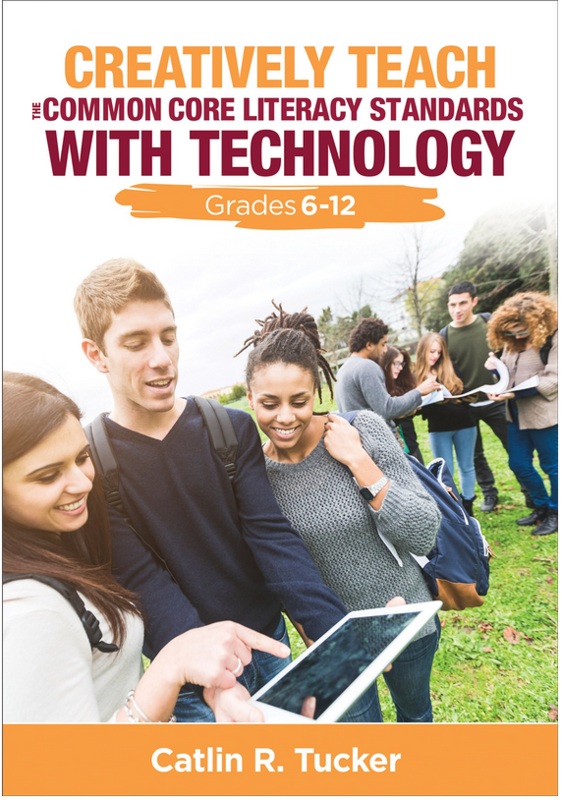 Do you know of any services without this limitation or do I need to move up to middle school in order to avail my students of edtech for the 21st century? Yes, students do need an email to use Google apps, but you may be able to set up blogger through your gmail and give students access to pages so they can create portfolios without an actual email. I have not done this myself though. I did connect with a teacher who has an Edublogs account, then allows students to have a page on that blog that they can use to create a porfolio. Another option if you have iPad is to have them create portfolios with an app like Creative Book Builder. Their portfolios would take the shape of an actual book on the iPad, but they can also be published to the web creating a portfolio. I threw a request out on Twitter for suggestions and got a recommendation for Three Ring (http://threering.com) and Kid blog (http://kidblog.org/home). I hope one of those works for you! I have spent some time this summer contemplating just this…what platform to use. But after looking at your student examples, it makes perfect sense to me to let kids choose. I let them choose almost everything else, why not! Thanks for this post! You are so welcome, Deb! I believe choice can fuel their excitement about the project and promote ownership. Thanks for sharing your process and some student examples. I’m presently working through the process of choosing a digital portfolio platform as well. We are a Google for Educators school board and have used both WordPress and Kidblog in the past. I appreciate that you gave your students the choice of a platform (something I would do if I were in just one classroom for sure!). Some of the considerations I have are longevity (ideally the portfolio will carry through the students’ career), adaptability and compatibility (students use Google docs already for daily work; we are a 1:1 school board with PC netbooks and iPads so the program must be compatible), and of course, a platform which will be user-friendly for students and teachers. Our teachers have used WordPress for class blogs and we love the ease-of-use for kidblog as it has both the iPad app (SO easy to use our primary students had no trouble at all), as well as the web-app for other devices. I, too, am wondering about a Google site. I REALLY want teachers to have the freedom to adjust privacy settings (grade-appropriate as well as comfort level). 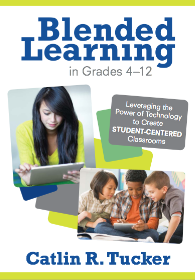 Some of the reasons for choosing to focus on digital portfolios k-12 are: showcasing student work and focusing on higher order/ critical thinking, as well as metacognition and learning skills. Any suggestions out there for us in terms of platforms? Any other considerations we may not be addressing? You sounds like you are exploring many of the platforms I am aware of. I did have students who chose to use Weebly and Wix, which are two other website creators worth checking out. Weebly is super user friendly, but WIX sites look very professional. 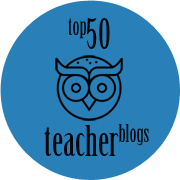 Kids blogs and Edublogs are both great! I’d suggest using a site that does have an easy iPad app if you are using iPads. Some website creators are not as iPad friendly. Thanks for the great tips Catlin! Any suggestions on sites that make blogging easy for students? I would like for students to update a class blog each week to explain what they learned by writing and embedding videos/photos. Also, wikispaces or collaborize classroom? I would suggest Blogger if you are already using Google apps. 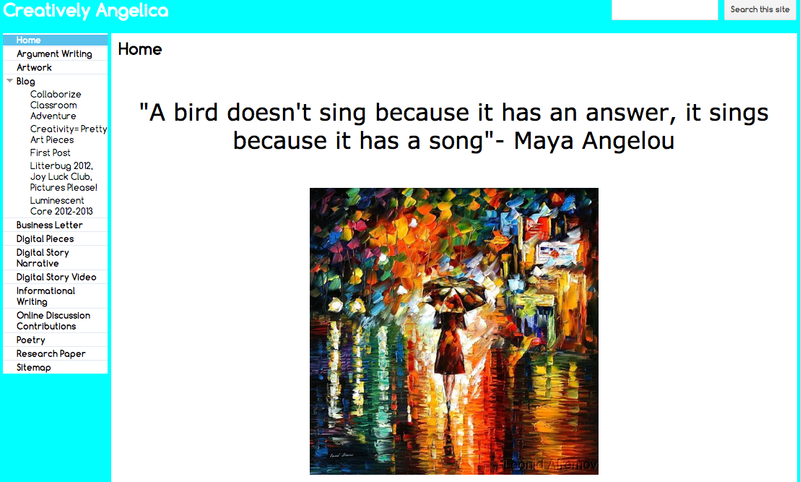 You can have a blog students contribute to or they can create their own. Another alternative to Blogger is Edublogger. Edublogger looks and feels just like a WordPress site. I don’t have much experience with Wikispaces, so I cannot say if that would meet your needs. Collaborize Classroom is a dynamic online discussion platform, which I use and love, but it is not a blogging tool. I wanted to thank you for inspiring me! I’m teaching English and Visual Art at the S.F. School of the Arts. I have been using Collaborize starting this year and the students love it. Our principal was very impressed with it and wants to institute it school-wide. My question is: I recently introduced the idea of Digital Portfolios to my students via this post. Many of them were concerned about putting that kind of personal information on the web and seemed resistant to the whole idea. I was quite surprised to hear this from them and didn’t expect that kind of reaction. Thank you again for all your great work ! Have you tried bulbapp.com for portfolios? Bulb is an app for publishing portfolios and projects. Students use bulb to document their process, showcase their work, and collaborate with a group. Teachers use bulb to publish their lessons or share their student’s work with parents and faculty. 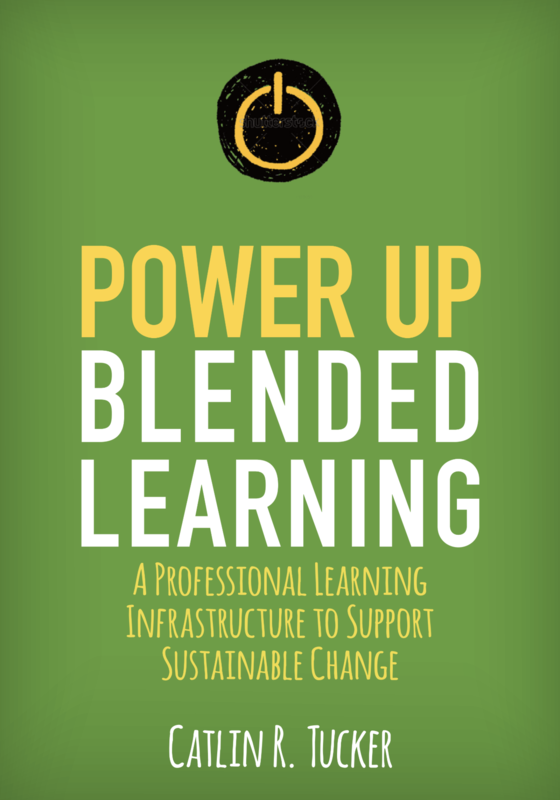 Bulb is outside of an LMS or other school system, so it goes wherever the student goes: it can be used as an alternative assessment tool, submitted when applying for colleges, scholarships or a job, or just to share with friends and family. I know I’m biased, but I think it’s worth checking out! It’s so much easier than Googles site. Google sites isn’t exactly intuitive, but I love how easy it is for my students to embed all of the work they do using Google apps. That said, the majority of my students opted for WIX this year. I like to give them total autonomy when they select a website creator. It looks like students can create a free Bulb site, so I am happy to check it out. My district doesn’t pay for anything technology related, so I primarily use free tools with students. It would be great to see a range of portfolios to get a sense of what they looked like overall (you know, an average one, a weak one, and then these fabulous ones)! That way, we could possibly anticipate some of the issues our students will face as they create these and possibly work to get them better! Thanks! This is a great article and very inspiring to me as a teacher! Hi Catlin! Two questions for you- did you use a rubric to assess the content? If so, would it possible to share that? Also, how did you handle students who either didn’t get you their URL or had nonworking websites? I use Weebly and I know if I don’t click ‘publish’, it doesn’t show. Yes, I use a rubric to assess all their work. For the digital portfolio, my rubric was on a scale of 1-4 and had the following criteria: aesthetics, organization/ease of navigation, artwork, quality of editing and revising, depth of reflection in blogs, and content requirements met. I had all of my students submit their digital portfolios via a Google Form and had a TA click through all the websites to make sure they were live. I actually didn’t have any issues this year. In the past, I’ve had student using Google Sites not share their sites publicly, so that was an issue. It is such a worthwhile project! It does take some serious time to assess though! I didn’t want to do the usual paper portfolio I have done in the past, with my 6th graders, because it’s so hard to book enough computer lab time for students to design, type and print toward the end of the year. This is my first year using Classroom and I thought I would give the digital portfolio a try. I set up the same requirements I always use, directions, etc. and began. My students LOVED the idea, and are putting their pieces into a portfolio folder this year. I loved your idea of a webpage. The flow of the webpage really works better than the folder. I’ve also given some thought to using Slides. Have you tried that approach. I would love to hear some ideas from those who have done the webpage and/or slides. This year was a learning experience, but next year I will be totally prepared. I’ve never done slides because I want them to embed their documents so that the edits they make on the back end surface on their web page. Google documents and Weebly allow students to embed Google Docs. If students are using WIX (…I don’t recommend for 6th grade), they have to link to their documents. I’d suggest Google sites for easy web-based portfolios that will work with all their Google Apps work. Here is a blog I wrote about “Getting Started with Google Sites“. It might be helpful. My pleasure, Wendy! I enjoy sharing what I am doing that is working. How do you keep track of all of your Ss in a manageable way of all their portfolios are in one place? Oh great Idea! Do you have to get parent permissions for the various platforms…? No, I don’t. I let parents know what we are doing then students select the website creator they want to use. Wow, what a fantastic idea! This will keep students engaged and they’ll feel a sense of pride in seeing their work published. So many different opportunities with digital portfolios.